Continuing on from my last post on My favourite apps for busy consultants, as promised, today I am going to share with you some of the social media sites and apps I use. I’ve heard its best to focus on a couple of sites, rather than try and maintain a social media presence on every site. As you get comfortable with one, you add another. For me, the main platforms I have used are LinkedIn and my own blog, although I have recently branched out into Twitter and Pinterest (and I exist on Google Plus but don’t really use it). All of these sites I use on my PC as well as on my iphone and ipad. For me, social media is something I use professionally, and not in my personal life at all, so one big absence you will notice from this list is Facebook. I’ve been considering setting one up recently, as I have heard Facebook is becoming more of a business site rather than just a place to share your personal life with the world. I’d be interested to hear what you think of Facebook and if you use it for any professional purposes. I’ve been using LinkedIn actively for quite a few years now. I started out one quiet January in a competition with a colleague to see who could get the most new connections by the end of the month – with the condition that you had to met the person in person. Today I now have some connections I haven’t met in person, but through my online activities, however, I still use LinkedIn primarily for keeping in touch with industry friends and colleagues. The ability to maintain current contact details for people I see infrequently in many different cities has been a fantastic use for LinkedIn over the years. I’m always looking for more ways to use LinkedIn than as just an address book though. I’ve always been keen to populate my profile with images, slides or other media features (the options for which are frequently changing). When I was job hunting last year I spent a bit if time learning about optimizing my profile for search hits – which does seem to be something you can work with for recruiters but I’m not sure how useful it is for anything else yet. At this point in time, I can’t say I have found LinkedIn to be a particularly useful tool for finding new business as a corporate interior designer – but I think there could be possibilities in future. I’ve also tried to think of ways to use LinkedIn to get my network working for me. Posting up that I was looking for a designer clock one day met with some success – quite a few options saved me some time trawling the web. Primarily these days I use LinkedIn to find and share blogs as well as publicizing my own blog. I am a member of quite a few groups and subscribe to daily or weekly digests of group activity. I usually scan these at breakfast and then save to my safari reading list the posts I want to read later – and which if I like, I will then share with my network. I also use the groups to share my new blog posts with readers outside of my own network. Having recently signed up for Twitter, it’s great that I can share something on LinkedIn and have it automatically post also to Twitter. You can find me on LinkedIn at au.linkedin.com/in/ceilidhhiggins, but if you are going to send me an invitation, include a message with why you want to connect as I don’t accept invitations unless I know why you are interested in connecting. I have only recently signed up for Twitter, and it’s certainly a platform I feel like I’m still getting to know. Like LinkedIn, I use it to find news and blogs and to share what I am reading or writing. Additionally I have been using it to share comments live about events I have been attending. I know some people also use it to have conversations with other Twitter users, but I haven’t really used it that way much so far (though I’m definitely considering the possibilities for making customer complaints – I have heard AutoDesk are most responsive via Twitter). Next weekend you will find me tweeting from TEDx. The biggest difference I have found between Twitter and LinkedIn, is that mostly on Linkedin you talk to and share with people you know (except in groups) whereas on Twitter you can follow anyone, anyone can see what you tweet and you might have many followers who don’t know you personally. People might retweet and favourite your tweets based upon using either twitter handles – this is basically your user name, mine is @ceilidhhiggins, (themidnightlunch was too many characters) – or by using hashtags (the # symbol in front of a word). I don’t totally get hashtags yet, but don’t let that stop you using Twitter – apparently few people do. But basically the hashtags allow you to categorise a tweet so other people might find it when searching. Also, don’t let the somewhat strange idea of the 140 character message stop you from signing up for Twitter. You don’t have to Tweet at all you can just read other tweets, and many tweets actually contain links to blogs and websites. You can now also include images in your tweets too. But of course if images are your main thing there are better sites for that such as Instagram, Tumblr (both of which I don’t use) and Pinterest – which I do. I signed up for a Pinterest account about a year ago, but I’ve only just started to use it. Again for me, it’s a professional tool rather than something centred around my personal interests. A lot of people are using Pinterest as part of hobbies and home renovations as well as professionally. All you will find on my Pinterest right now is one board (find me as Ceilidh Higgins) – which is inspiration images for a current project – I do also have some current projects set up as secret boards too. This way you can chose if you share your boards with everyone or just with people you invite. I generally find the images in the same way I would have before – via google searches or specific architecture and interior design websites and then use the Pinterest bookmarklet tool to save them to my boards. I share the boards with the project team so everyone can view and add images – wherever they are. It’s a great way to communicate ideas with remote team members. I have also convinced my office to start setting up an account – we are in the eary days of adding images and haven’t yet made them public boards. It’s certainly a much quicker way to get images of our recent projects out there than a traditional website update. Our practice boards will only be used to display our own work – the Pinterest terms on intellectual property seem to be a potential minefield for companies and we wouldn’t want to be accidentally infringing other practices or their photographers intellectual property or suggesting their works were our own. If you want more on social media for architects and interior designers, I recently listened to a great podcast from The Business of Architecture, Enoch Sears interviews Aurora Meneghello the Director of Marketing for Novedge (an architecture software company) on social media – and there is also a prior interview on marketing as well as many other resources (including an ebook on social media which I haven’t read yet). Finally for me the last social media platform is of course this blog, but I’ll save some further chat on that for another day! What social media tools do you use as an architect, interior designer or consultant? Is social media useful as a means of keeping in touch with your clients – or do you use it more for industry networking? Do you have any ideas on how architects or interior designers can use social media as part of their design process? Or for business development? And finally, should I get a Facebook page? Social media – design collaboration via digital means? In my last role I used to spend a lot of time working with remote teams – often remote from me and sometimes from each other. Over time I realised that one of the biggest challenges in working this way was the lack of informal “overheard” conversations. For example I might be briefing one person in the team on a task but start talking generally about how the meeting I had that day went, someone else in the team sitting near by might overhear and join the conversation with a new idea. This lack of proximity and informal collaboration is also a traditional problem in the relationship between interior designers or architects and engineers. The question is, is it possible to replicate this casual form of interaction digitally? Social media is frequently described as the new water cooler, just one recent example can be found here. 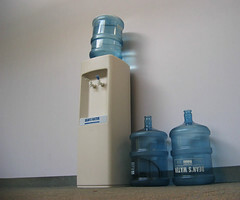 HP’s internal social media platform was also called WaterCooler. Although I have to say – the image I found looks just the opposite doesn’t it – and I’ve always found coffee to be more popular than water! Regardless of your drink preference, is social media the current or future digital means for casual work interactions and collaboration though? Personally, I found social media useful on certain occasions – I became the first person in my company to post my redundancy on yammer the internal network – for me this meant a lot of people found out in hours rather than weeks (and I also had posted personal contact details). However on a day to day basis it wasn’t a tool I used extensively. I found instant messaging to be much more useful, but the limitation is that it is generally a one on one conversation. The guy that sits next to me can’t overhear and put his 2 cents in (this privacy is in fact often becomes the reason people chose messaging as the means of communication). However, I still don’t believe that social media can completely replace the informal, overheard, in person element of communication. Firstly by typing something into a social media site it is much more of a deliberate sharing action. Secondly I find that people are less likely to respond. If I speak to you in person or on the phone you are more likely to say something than in front of a large meeting. If I instant message you rather than email you, you are more likely to respond partially because of that annoying flashing but also just social convention. If I post something on social media (or to this blog!) it has become a combination of email and the large meeting – for most of us it becomes too public, too deliberate and just too much effort to respond with a comment. Perhaps partially because we know that if we start commenting on everything we will be there all day – and maybe no one will notice – unlike if we spend all day at the water cooler or coffee shop! I started thinking about this one, maybe this means the whole office will become like a giant telepresence room where half the office is a mirror image of somewhere else. Or maybe through one window we see one place (say Perth) and through another we see another place (the engineers down the road). For anyone not familiar with telepresence – right now its typically limited to meeting rooms. Traditionally you have 2 identical rooms, each one is only half a table though, the other side is a video screen. Its still pretty expensive so not that commonly installed. The technology has been around since about 2006 but doesn’t seem to have made much impact – probably due to the cost and the need for the 2 identical locations. Maybe we all sit in different places but have our holograms working in a shared project office? This hologram would seem to have more potential as an architectural or engineering collaboration tool. because not only can we share ourselves, we can share our models as holograms too. All of this moves away from social media as a solution, and back towards physical solutions – even if they are driven by technology, they are still attempting to replicate a physical environment. Do we need a physical environment to collaborate best or is social media already taking over and replacing this? Will this perhaps change as the workplace demographics change? What is your experience worth social media in the workplace? Do you think social media is the new water cooler? What are your success stories (or horror stories) of using social media for collaboration in interior design or architecture? Do you want your engineers (or interior designers or architects) right there with you? If we were having this conversation in person would you comment?